What is this Isaac Toast huh? Re: What is this Isaac Toast huh? Looks pretty much like some kind of toast that I can make at home too. Done it before, but without all the hype. Another Korean thingy where people go crazy about it. The queue was extreme. I saw the menu, but personally wouldnt go queue for it. Hopefully the craze is awhile, as the queue jam up the whole area. Pics are deceiving!! how much for that toast again? 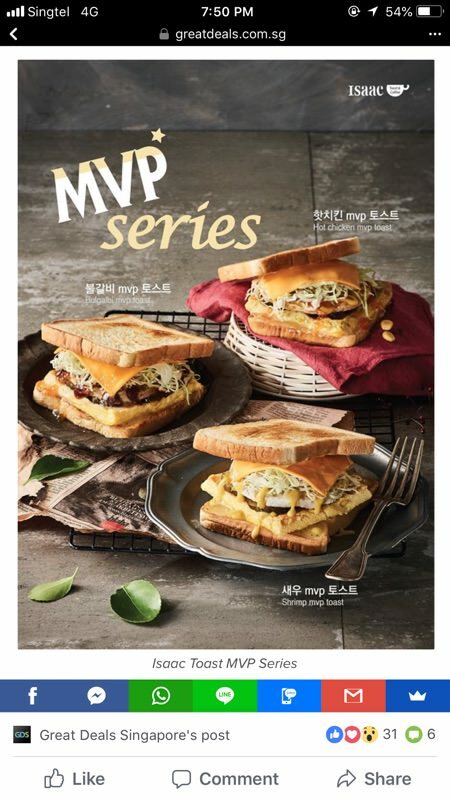 there's even an episode on eatbook sg talking about this toast. The queue has lessened since i saw last on Friday .... hype is over? In fact, I am still amazed at how Irvins chips is still standing strong. Up till now there's still people Q-ing up early in the morning everyday to get a few packs for whatever reasons. Can't believe that expensive chips like this are growing strong. I saw some indonesian families loaded up on Irvins on the SQ flight over to Jakarta. I bought a few packs as gift for overseas friends. Well it's not that amazing if you eat them once awhile. But for overseas visitors, they are more like SG local delicacies. So there's still hype over it. I heard my friend from Macau, he says he always ask one of our friend to bring a few packs to Macau for him. Must be those rich rich kinds of indonesians. Some more taking SQ flight. Irvins so ex already in Singapore to begin with. with that kind of price, I can buy 2 packs of ruffles chips in NTUC during promotion with change to spare. lol.